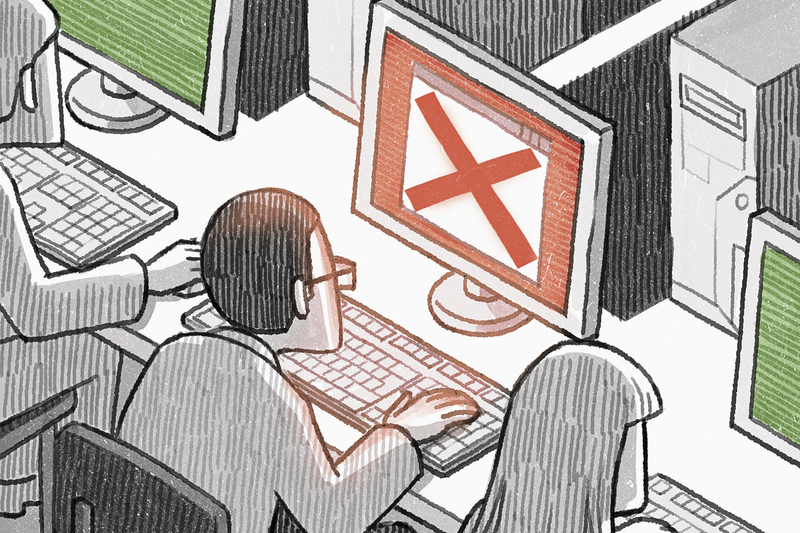 With Ad Blocking Use On The Rise, What Happens To Online Publishers? : All Tech Considered A new Apple update could challenge the current online business model. Some say less ad revenue means more sites will charge for access to content. There's also a move to block the ad blockers. The rise of ad blockers threatens the business model that drives much of the Internet economy. Advertising is the basic business model of the Internet. It's one reason we can view online content free of charge. Millions of Web surfers already download software to block ads online, and that number is growing. Soon, Apple could be making mobile ad blocking easier. When the All Tech Considered team tested out the popular ad blocker, Adblock Plus, YouTube videos started without a commercial first, and on newspaper websites, the ads disappeared. As you can well imagine, that doesn't sit well with sites that sell online advertising. Google gets 90 percent of its revenue from online ads, and mobile ads make up 73 percent of Facebook's ad revenue. So, how is the freedom to choose not to see ads faring in the Web economy? And how are publishers fighting back? To gauge what blocking ads could mean for the online advertising industry, NPR's Robert Siegel spoke with Business Insider's global advertising editor Lara O'Reilly; Tim Schumacher, chairman of Adblock Plus; and Ben Barokas of Sourcepoint, a firm trying to counter ad blockers. How Big Is Ad Blocking Use? "According to some estimates, 144 million people globally used an ad blocker last year, and that was up 70 percent year on year," O'Reilly says. "So it's definitely on the rise, but it's not necessarily a large proportion of the Internet population. It tends to be the more technically advanced user, skewed toward males, gamers and so on." According to Apple's prereleased developer documentation for new versions of its iOS and OS X operating systems, which run on the iPad, iPhone and Macs, the company plans to bring content blocking extensions to the Safari Web browser. Apple is being ambiguous as to why it's introducing ad blocking. "What they're saying is that they will allow developers — people that build apps — to build extensions that block content on Safari," O'Reilly says. "And it does stipulate that that could include ads. And Apple hasn't confirmed what it means by this yet. What we can assume is that you can say, I want to block pop-up ads but I don't want to block banner ads or video ads." How threatened are publishers, search engines and social media sites if readers can opt out of the ads? After installing Adblock Plus to the Chrome browser, Wired.com, for example, greets users with a message where the ads would otherwise be: "Please do us a solid and disable your ad blocker. ... Add us to your whitelist." A whitelist, in this case, is a list of certain websites that the user allows to pass through the ad blocker filters to serve ads. "Depending on how far you go, the doomsayers say this could be the end of the free Internet as we know it if ad blocking becomes mainstream," O'Reilly says. "Every time you go to a free Internet site, whether you could've realized it or not, a transaction takes place. You're viewing content for free, and in exchange, the publisher serves you ads." Adblock Plus is the most-downloaded ad blocking software for desktops, with 400 million installations, and draws 50 million to 60 million monthly users. Companies that depend on advertising online say there will be a lot less content on the Web if there's a lot less ad revenue, which means there will be a lot more places you have to pay for access to view the content. On this possibility, Adblock Plus Chairman Tim Schumacher says, "I think those companies are right and that's exactly why Adblock Plus actually has a different way of being an ad blocker. Now, first of all of course, people love to block annoying ads. Especially video ads, pop-ups, Flash banners, everything which is really getting into the way of reading content online. Now, at the same time, publishers' interests are really important and so, we've come up with what we call 'acceptable ads,' and those are ads which are non-annoying. Small text ads, small pictures, anything which is not interrupting the viewer's flow and they still help financing the Web and that's what we believe the Web needs to be." These "acceptable ads," from any advertiser, can pass through the Adblock filter on any site without having to pay to be whitelisted, Schumacher says. "The most important thing is really if ads are meeting the community-set criteria. And if they do, they get whitelisted," he says. "Ninety percent of companies and individual blogs get whitelisted for free. Our model really is just that the big companies, they need to pay and they basically need to finance that model for everyone else — and that's about 10 percent of companies." An ad blocking arms race could occur when software is developed to block the ad blockers. If that happens, Schumacher says, "we're up for the challenge, but we don't welcome it because we don't think it's the right thing to stick advertising to users who've actually made a conscious choice of not wanting to have advertising. We actually think it's better to tone down advertising for those users, appeal to those users and have a dialogue with those users as opposed to just sticking the ads down their throat." Schumacher, who worked in online advertising previously, says he "saw what has been going wrong. That's why we started Adblock Plus and said, 'Let's make this better.' "
Ben Barokas, who has worked in the world of online advertising since the 1990s — most recently for Google — wants to counter the trend toward ad blocking. His company, Sourcepoint, is a "content compensation platform" that gives the user less of an all-or-nothing ad viewing option. "We believe that any user has a choice of whether or not they want to consume advertising, or that they're able to subscribe," Barokas says. "We believe that users would love to surf from site to site, device to device without hitting pay walls and consuming unnecessary ads." He says, "We find it necessary to punch through the ad blocker or circumvent it — however you want to say it — in order to provide the revenue to the publisher." Barokas says the "acceptable" ads distinction in Adblock Plus should be a consumer choice. "I would say, one person's trash is another person's treasure," he says. "Some people would rather watch a one-minute video ad once a day; others are OK with banners and buttons. But that's something that an individual user can decide and not a company like Adblock Plus."